Relax and unwind in your modern hotel room or one/two bedroom self-contained apartment – all with individually controlled air-conditioning as well as ceiling fans, internet access, cable TV and most with large balconies. 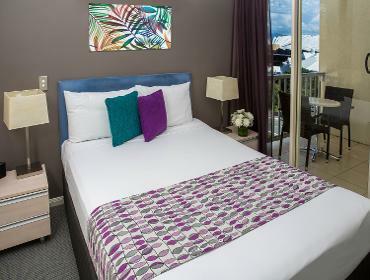 To enhance our guests’ experience, our Executive rooms have recently been given a fresh new look including freshly painted rooms, new block out and sheer curtains, along with new outdoor settings for your comfort and a convenient microwave oven. Park Regis City Quays can assist you with all your business-related requirements to ensure your business matters are dealt with smoothly and efficiently. Please note: Reception hours are 7am to 9pm Monday to Friday, 9am to 9pm Saturday & Sunday, 9am – 5pm Public Holidays. If you are likely to arrive outside reception hours please contact us 3 days prior arrival date to arrange after arrival check in. 07-40426400. Spectacular sights and experiences await you in Cairns. Take advantage of Park Regis City Quays’ tour booking service and find yourself snorkelling the Great Barrier Reef, sailing the crystal blue water on a catamaran or white water rafting on the Tully and Barron Rivers…the options are endless. 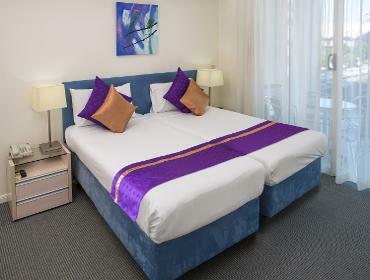 Whether your stay is for business or pleasure (or a bit of both) – Park Regis City Quays is your ideal ‘home away from home’ whilst in Cairns. Extended and long stay guests are welcome at Park Regis City Quays – click here for more information. 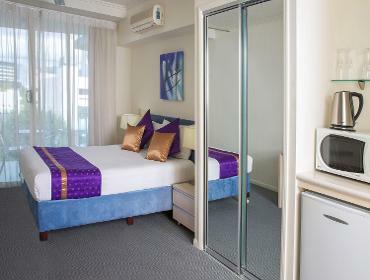 Park Regis City Quays ensures a truly peaceful and relaxing retreat during your next visit to Cairns.